Inaugurated exactly 50 years ago (April 4th, 1967) – But would you recognize the person on this relief without nameline? I strongly suppose, you would not! This is not surprising, in particular as this relief (arcade court, University Vienna) was made by the famous Austrian sculptor Alfred Hrdlicka (1928-2009), who is known for his unconventional approach to art. As a template he took the well-known Semmelweis copper engraving (1860) of Jenö Doby. “If you compare this work with the relief you can probably recognize similarities”, Dr. Martin Engel from the Institute of Art History explained to me. In comparison to other facial features, mouth and eye area are designed in great detail. The attention is focused on this area, and this is quite legitimate, says Engel. The Semmelweis relief of Hrdlicka was opened exactly 50 years ago (April, 4th, 1967). Actually, it should have been opened two years earlier on the occasion of the 100th anniversary of the death of Ignaz Semmelweis (August, 13th, 1865), but the university, which has commissioned the work shortly before this anniversary did not take into account that the artist would need his time. “But the university made a good choice”, says Engel – Alfred Hrdlicka was about to become a well-known artist at the time. One year before (1964) he represented Austria at the Biennale in Venice. 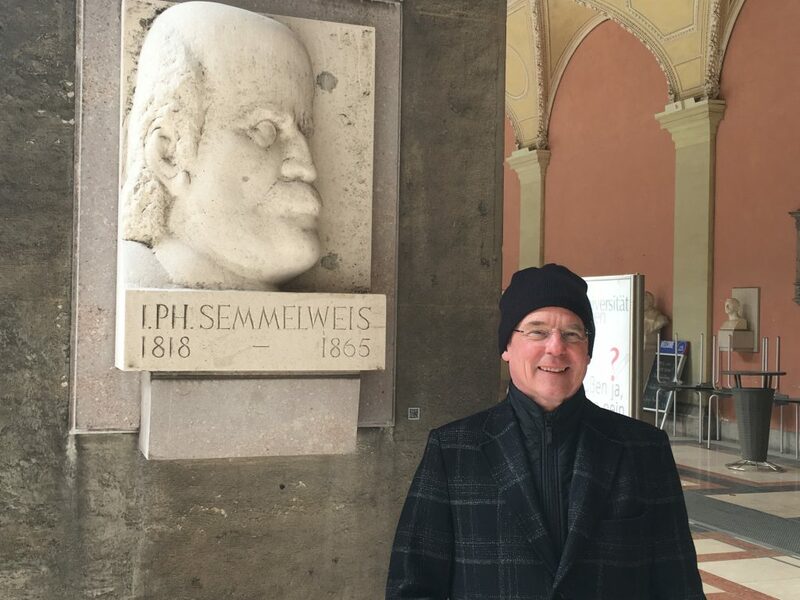 And in fact, standing in the arcade court of the university Vienna, The Semmelweis relief (which is one of overall 154 busts and reliefs) is a bit out of the ordinary. By the way – Two weeks before my interview with Dr. Martin Engel in front of this sculpture I met Dr. Anna Durnova (she published a book about Ignaz Semmelweis in 2015) on the same place for an interview (Semmelweis film that will be presented at the symposium* on June, 21st ). She will discuss with Prof. Didier Pittet, WHO Collaborating Centre on Patient Safety, Prof. Markus Müller, Rector of the Medicine University Vienna, Prof. Klaus Markstaller (Medicine University Vienna & Vienna General Hospital) and Captain Hans Härting who contributes his expertise in aviation safety. https://semmelweis.info/wp-content/uploads/2018/04/img_1996-1024x768.jpg 768 1024 Carola Timmel https://semmelweis.info/wp-content/uploads/2018/11/logo2.png Carola Timmel2018-04-03 09:31:112019-01-09 12:01:14Inaugurated exactly 50 years ago (April 4th, 1967) - But would you recognize the person on this relief without nameline? Our film shooting in Budapest – impressions and touching encounters Frankenstein or Semmelweis?